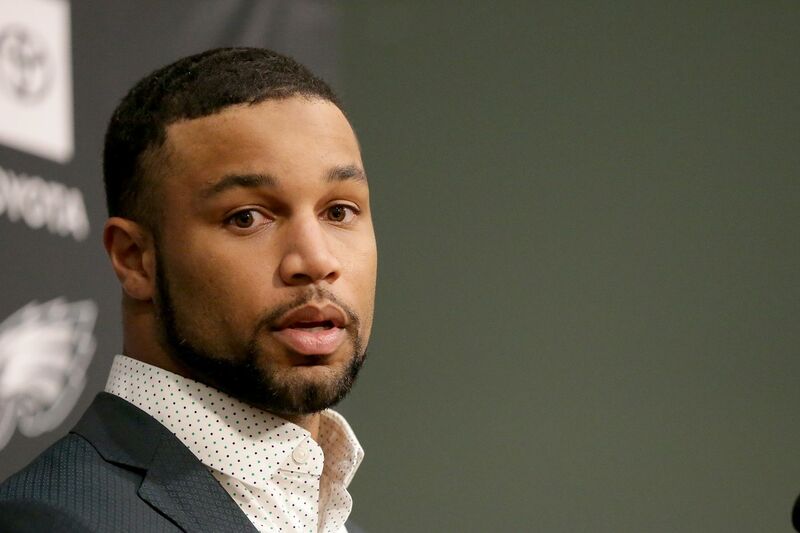 Golden Tate answered questions at a press conference Wednesday. Good morning and welcome to November, when the Eagles will need to make their push in the NFC East. A busy bye week slows down today. There is no scheduled media availability after Golden Tate's introductory news conference yesterday, and the team is off until next week. Reporters cover the press conference for new wide receiver Golden Tate. Golden Tate heard trade rumors leading to Tuesday's deadline and knew the Eagles were among the interested teams. (He heard the Cleveland Browns and New England Patriots as others.) But he didn't think he would be traded until he received the phone call informing him while he left a doctor's office Tuesday. "My mouth kind of dropped a little bit," Tate said. "I read all the articles. I talked to my agent several times. I think I found out before my agent did. It was a shock. It was kind of information overload; it was only two minutes of talking. It kind of threw me off. … Realistically, my brain didn't wrap around it until it actually happened." Tate said all the right things about coming to Philadelphia, mentioning the passion of the fan base – he saw it first-hand on his flight from Detroit – and excitement about competing for a championship and playing more than eight games in an Eagles uniform. He didn't know how he would fit in yet, but he already started his crash course on the offense. He'll need to learn not the entire playbook, but rather, the routes required of him early in his time with the Eagles. He's thankful it's a bye week so he'll get a chance to learn the system for the next week. Remember, last season, Jay Ajayi played a few days after his trade. Tate will meet his new teammates next week when the Eagles begin practicing for the Dallas Cowboys. Tate is known to be one of the NFL's best receivers in yards after catch. He leads the NFL in YAC since 2016 with 1,528, according to Next Gen Stats. Look for the Eagles to take advantage of this ability, especially in the short passing game as they've been doing with Nelson Agholor this season. That allows for quick throws from Carson Wentz. I wouldn't be surprised if the Eagles use them at times instead of the running game. Tate, who is 5-foot-10 and 197 pounds, attributed his strong legs for a big part of why he's so good after the catch. It helped him as a running back in high school before he arrived at Notre Dame. "Once I got to college, I made the transition to wide receiver," Tate said. "My mom always told me, 'You can't hit what you can't catch.' I don't like to be tackled, so I just try to fight for every yard. I feel like I get the ball in my hands, there's a chance I can break it and take it, take a 5-yard pass 20 yards, 30 yards – sometimes 80 yards." "I think I kind of grew into it. You can't really be a dull person with the name 'Golden,' I guess. But I'm actually the third, and there's really no super, awesome, cool story about it. I just tell people, I figure somebody was drunk at some point, right? But yeah, it was kind of a struggle when I was younger. Got made fun of a lot, kind of haunts me sometimes. Since then, I've grown into it, embraced it, and I love it." Golden Tate arrives for his press conference. Golden Tate met Eagles fans on his flight to Philadelphia. He wants them to see him play more than eight games for the Eagles. Carson Wentz is playing brilliantly, Marcus Hayes writes. The Tate trade will make him better. What was on the minds of Eagles fans Wednesday? Find out in the weekly chat. Both this season and last, the Eagles have had a large number of hamstring injuries and muscle pulls. Looking at the injury reports from around the league, the Eagles seem to be well above the norm in the number of these types of injuries and the length of time that players are out due to them. Is anyone but me questioning the ability of the training staff to properly prepare the players in order to avoid these types of injuries or at least lessen their severity? – Mike D.
Good question, Mike. I know the Eagles are looking into this very question, specifically as it relates to the soft-tissue injuries. Every team has injuries, but with the Eagles, the number of hamstring injuries has been notable this season. The length of time varies by player and position, but more of the question is why there's a relatively high number of these injuries on the Eagles. I can't speak right now to how it relates to other teams in the NFL, but I can speak to how it compares to other seasons. I'll dig deeper in comparing it to other teams. The Eagles changed their medical and training staffs during the offseason, so last year and this year are different stories. Injuries are the reality of the NFL, and some players are more prone to injuries than others — especially players coming off another injury. The Eagles have a few players like that. (Darren Sproles is an example.) There's not a good answer now, but the Eagles are exploring this question.